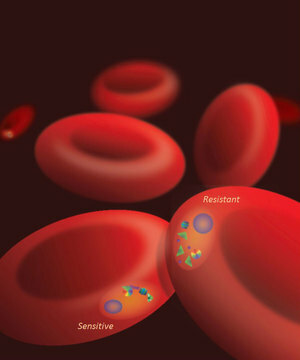 University of Notre Dame researchers led an international team to identify a molecular mechanism responsible for making malaria parasites resistant to artemisinins, the leading class of antimalarial drugs. According to the World Health Organization’s 2014 World Malaria Report, there are an estimated 198 million cases of malaria worldwide with 3.3 billion people at risk for contracting the infection. Although the impact of malaria is still significant, the statistics reflect a considerable reduction in the global malaria burden. Since 2010, disease transmission has been reduced by 30 percent and mortality due to malaria has decreased by almost half. Although artemisinins have been widely used and investigated, no one fully understood how they worked or why clinical resistance has emerged. Laboratory studies showed that artemisinins were always active against the mature parasite stages that sequester in tissues, but clinicians were observing resistant infections from patients who were still in early stage of infections. In addition, previous genome wide association studies of P. falciparum identified genes associated with artemisinin resistance, but it was unknown how the genes worked. This Notre Dame-led study identified both the target of artemisinins in the clinically affected ring stages and how a gene named PfKelch13, a dominant marker used to track the parasite’s resistance, causes artemisinin resistance. The study, “A molecular mechanism of artemisinin resistance in Plasmodium falciparum malaria,” was published online in Nature Wednesday (April 15). This work was supported by the National Institutes of Health, the Parsons-Quinn Endowment and Notre Dame International. Originally published by Stephanie Healey at news.nd.edu on April 15, 2015.